This sign is only for the folks who have a sense of humor. Come on, everyone has had a visual like this at least once in their lifetime! Give this sign as a gift or buy it for yourself and see how many people you make smile. If this picture reminds you of yourself...then OWN it! Be proud! We all know these kind of guys are the nicest "good ole boys" to have in your life. Made in the USA! 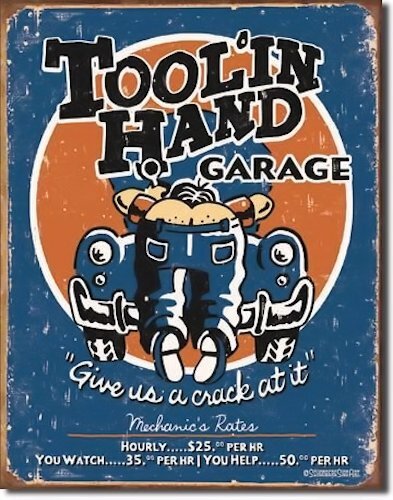 Ask a question about "Tool'In Hand Garage" Tin Sign.